Tag line: "THE BREATHTAKING SAGA OF THE UNITED STATES CAVALRY!" Now here’s a John Ford film I had never seen before! 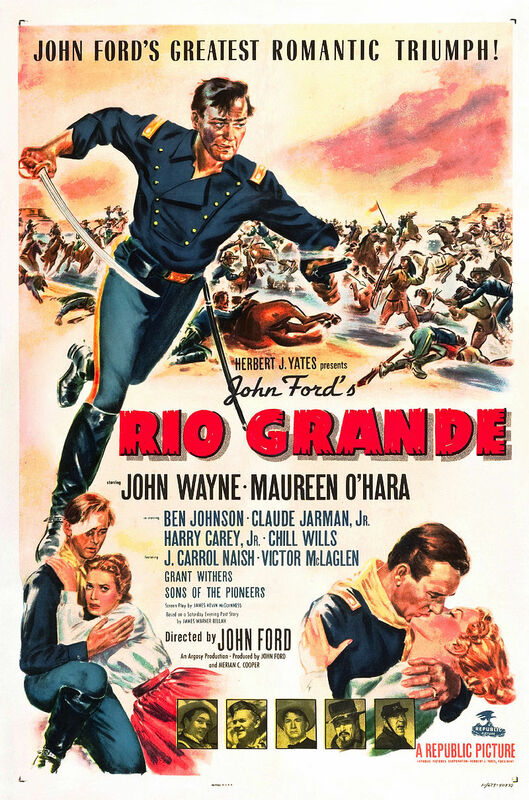 Made one year after She Wore a Yellow Ribbon, Rio Grande was yet another of the director’s Cavalry-themed flicks, a movie that, like many of Ford’s best works, mixed drama and excitement to great effect. Lt. Col. Kirby Yorke (John Wayne), commander of a Cavalry unit, has been tasked with stopping a renegade group of American Indians, who are carrying out “hit and run” raids in the area, then retreating into Mexico (despite the protests of Col. Yorke and his men, the cavalry is forbidden by U.S. law to cross the border and give chase). To add to his troubles, Col. Yorke is surprised to find that his son Jeff (Claude Jarman Jr.), who recently flunked out of West Point, has enlisted as a Cavalryman, and is one of his unit’s new recruits! The two haven’t seen each other in 15 years, yet despite being father and son, Col. Yorke tells Jeff that under no circumstances will he be given special treatment (which Jeff says is fine with him). The family reunion continues when the Col’s estranged wife (and Jeff’s mother) Kathleen (Maureen O’Hara) arrives unexpectedly, demanding that Jeff be excused from military duty. Though happy to see her, Col. Yorke refuses his wife’s request, while Jeff himself, who has become fast friends with fellow recruits Travis Tyree (Ben Johnson) and Sandy Boone (Harry Carey Jr.), tells his mother he has no intention of abandoning his post. As this family drama plays itself out, further Indian raids decimate the area, building to a final showdown that could put the entire Cavalry, and their nearest and dearest, in harm’s way. Rio Grande bears all the familiar traits of a John Ford film. For one, it was partially shot in Monument Valley, a locale the director had also used for Stagecoach, My Darling Clementine, and She Wore a Yellow Ribbon (among others). In addition, the movie features a number of Ford regulars, including John Wayne, Victor McLaglen (as Sgt. Maj. Timothy Quincannon)), Harry Carey Jr., and Grant Withers (as a U.S Deputy Marshal). Rio Grande has plenty of humor as well (most involving McLaglen’s ornery Irish Sgt. Major), and some rousing action scenes (the best being a chase in which the American Indians pursue a wagon train carrying the camp’s women and children). And, as Ford has done countless times in the past, the movie has some fairly effective dramatic sequences (aside from the family issues plaguing Col. Yorke, there’s a strong scene right at the outset, when the wives and children of the returning Cavalrymen, who have just come from a tense battle, line the streets, looking frantically for their loved ones in the hope they survived the ordeal). 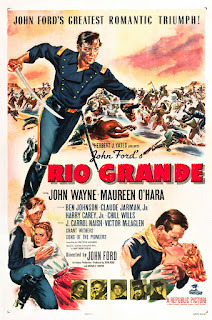 Rio Grande was a “compromise” picture for John Ford, who really wanted to make The Quiet Man (Republic, the studio with whom Ford had recently signed, convinced him to first direct Rio Grande in the hopes it would be a money-maker, especially since they believed The Quiet Man would tank at the Box Office).Yet even if Rio Grande wasn’t his dream project, the legendary director still managed to turn out a pretty solid movie.